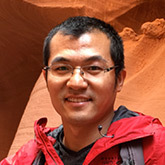 Hongkai Gao is a postdoc in the Julie Ann Wrigley Global Institute of Sustainability at Arizona State University. He was born in 1984 in China. He got his Master degree on cold region hydrology from Chinese of Academy of Sciences in 2011. In 2015, he got his PhD in hydrology from Delft University of Technology in the Netherlands. He joined in Professor John Sabo’s laboratory at Arizona State University in August of 2015. His research interests are on catchment hydrology, hydrological modelling, snow and glacier hydrology, land surface modelling, and ecohydrology. He found 1) climate controls the root zone storage capacity in catchment scale; 2) accounting for topography and vegetation information improves model transferability; 3) co-evolution of topography, vegetation and soil is beneficial to simplified catchment hydrological simulation.